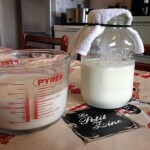 When it comes to home dairying the simplest way to start is with making yoghurt, kefir or another dairy based ferment. 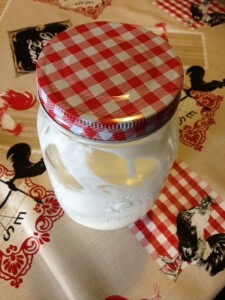 Kefir is by far the simplest of the lot as all you need is kefir grains, milk, and a kilner jar to get going. Yoghurt takes a little more work and a thermometer is a good investment for it – although I have successfully made it without. If you take a look at shop bought yoghurts the list of ingredients is huge. Yes you can buy plain yoghurt which is a lot simpler made, but all the flavoured ones are so sugared or awful added sweeteners that what should be a delicious healthy treat becomes a health hazard! The good thing with making yoghurt at home is that you don’t have to stick to cows milk yoghurt. I’ve made goats milk, soy milk, coconut milk, and raw milk yoghurts – all with varying degrees of success. You really don’t need a fancy yoghurt maker, in fact most recipes we’ve made have turned out better in a kilner jar, wrapped with a towel and put on the side of the Aga, near a radiator, or in the airing cupboard for warmth. One cultured milk that we always have on the go is kefir. It is so simple to make, full of probiotic goodness, and is wonderful added to a smoothie. If you find you are overflowing with kefir you can make soft cheese from it or pop the grains in the fridge with cold milk and slow down the process until you need them again. There are many other yoghurt-like cultures out there too such as viili and piima. Then there are cultures that can be made such as cultured butter milk (a great probiotic rich way of using up the left over buttermilk from home made butter) or bonny clabber when you have left your raw milk out too long.